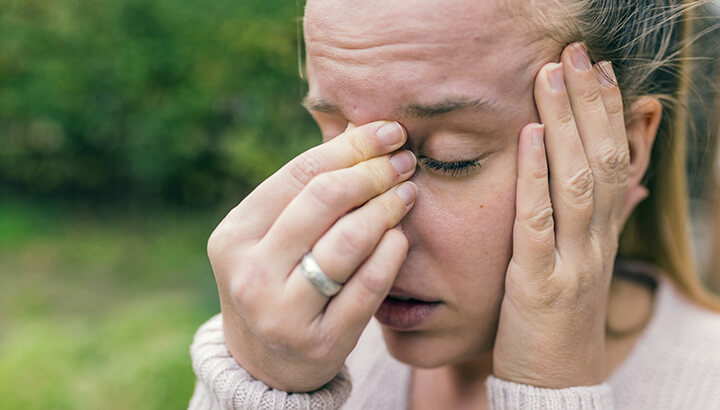 A stuffy nose, a sinus headache, sneezing, coughing, a scratchy throat: no, it’s not a cold, it’s seasonal allergies. If you’re like me, the last thing you want to do is take medication for your hay fever, and while there are numerous home remedies for allergies, did you know yoga can help too? As Dr. Baxter Bell, a medical acupuncturist and yoga instructor, points out, when we have allergies, we become irritated and annoyed. That goes without saying, but Dr. Bell also notes that when we experience stress, the immune system doesn’t run as well as it should. “Doing something that lets you unwind, like yoga, can help quiet your body’s fight-or-flight response, in turn quieting allergies,” he says. If you want to incorporate yoga into your allergy-fighting regimen, here are five poses that fight seasonal allergies. Any pose that opens the heart center like Warrior 1 helps to drain mucus from the lungs. Stand with your feet together, your arms at your sides. Inhale and step your feet wide apart. Breathe normally as you raise your arms above your head, palms facing each other and arms shoulder-width apart. Exhale and turn your right foot out 90 degrees, so it’s pointing toward the top of your mat. Shift your left (now back) leg, so it’s at a 45-degree angle to the right. It should be pointing to the side of your mat. Rotate the hips on the next exhale and face toward your right leg. Allow the right knee to bend gently and hold this position for up to 10 steady breaths. Repeat these steps for the left side. This pose opens the ribcage and lungs to encourage healthier breathing. Go into triangle pose on your right side, with your right foot pointed forward and your left foot at a 45-degree angle to it, just as in Warrior 1. Your right hand should be on or near the ground by your right toes. Use a yoga block to support this pose if you need to. Instead of raising your left arm above your body, as you would in triangle pose, allow it to rest on your left hip. Inhale and slowly bend your right knee as you slide your left foot forward several inches. As you do, reach your right hand about 12 inches forward on your mat. On the exhale, press your right heel and right hand into the floor and straighten your leg. Extend the left heel as you raise your left leg. Rotate your torso to the left while keeping your hips aligned, and gaze forward. The majority of your body weight should be in your right leg, not in your hand. Hold this pose for up to a minute before lowering your left leg back to the ground and returning to triangle pose. Repeat for the left side. Inversions like shoulder stand encourage your nasal passages to open. Only do shoulder stand for a short time — a minute or two — especially if you feel a lot of pressure in your sinuses. If you have neck pain, fold a thick blanket or two under your body, so your head rests just off the blanket, on the floor, as your shoulders and arms rest on it. Begin by lying on your back. Bend your knees and place your feet on the floor. Your arms should be at your sides. Press your arms into the ground as you reach your feet up and back behind your head. If you can, reach your feet to the ground above your head, as in plow pose. Adjust your shoulders and arms so that you can place your hands on your back. Lift one leg, and then the other, so that your feet are in the air. Adjust the pose as needed to lift your thighs up and away from your pelvis. Backbends expand the chest and lung capacity. You might find that bridge pose helps to open up the respiratory system to allow your stuffy nose to drain too. Begin on your back, with your arms at your sides and your knees bent. Inhale and lift your hips. Exhale and roll your spine back down to the mat. Repeat this a few times, moving with the cycle of your breath. Then, when it feels good, hold your hips in the raised position for eight to 10 breaths. Come gently back down to your mat and repeat if it feels particularly good at the moment. As simple as it sounds, the three-part breath can be one of the most healing yoga practice for seasonal allergy sufferers. To practice this type of breathing, draw the breath in. Allow your belly to fill with that breath, your ribcage and then your upper chest. Release the breath by reversing the flow. When we are stressed out — as can happen with an allergy attack — we tend to breathe in the top part of our chest. Three-part breathing reminds us to breathe fully and completely and reduces stress in the process. Breathe through your nose if possible, but even if you’re stuffed up, the benefits of this breathing practice make it worth doing. With each pose, be sure to remain mindful of the sinus pressure you may experience. Some head-down poses like headstand and downward-facing dog can add to the nasal pressure you’re already experiencing. Remember, when your body has an allergic reaction, it’s in a stress state. So go slow, take your time and care for your body as you fight those seasonal allergies. What’s your favorite pose to combat allergies? 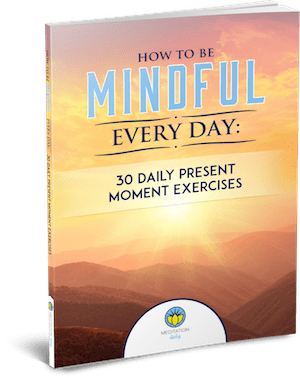 Get Your Free Copy of How to Be Mindful Every Day When You Sign up to Our Newsletter!